Hopi Katsina Dolls on my studio wall. Sports players are renowned for their rituals. Baseball players who never wash their hats? Octopus carcasses thrown onto the ice at hockey games? (major yuck & sad!) Nascar drivers who shy away from peanuts in the shell? People are strange. Creative and highly accomplished folk of all sorts have rituals too. Winston Churchill woke at 7:30 am and stayed in bed (working) until 11:30 am. Ayn Rand took Benzedrine, while Balzac drank 50 cups of coffee per day. As a night owl I was sad to discover that early rising seems to be a ritual of many artists who I admire, from Mozart and O’Keeffe to Frank Lloyd Wright. But Marcel Proust, Bob Dylan and Toulouse Latrec worked at night. Kafka began work at 10 or 11:30 pm and worked until 1-3 am. Tchaikovsky walked for precisely 2 hours a day, no more, no less. Benjamin Franklin read for two hours every morning, while naked. There’s a great book by Mason Currey which describes these rituals. And now the confession! I have my own superstitions and rituals. For a start: if I don’t write in my tiny moleskine journal every day I feel disconnected. And for some reason if I look at a clock and see that it is 2:22 or 1:11 or 10:10, or any repetitive time I get a burst of energy. It feels like a lucky, carpe diem moment. In my studio I burn piñon incense, or a pine scented candle, always lighting it before beginning to work. 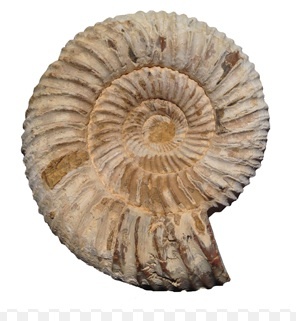 Ammonite- a fossil I found in a marketplace in Peru many years ago. I keep an ammonite on my easel as a talisman, symbolic not only of beauty, but as a connection to an incomprehensible ancientness, which for some reason is reassuring and inspiring. 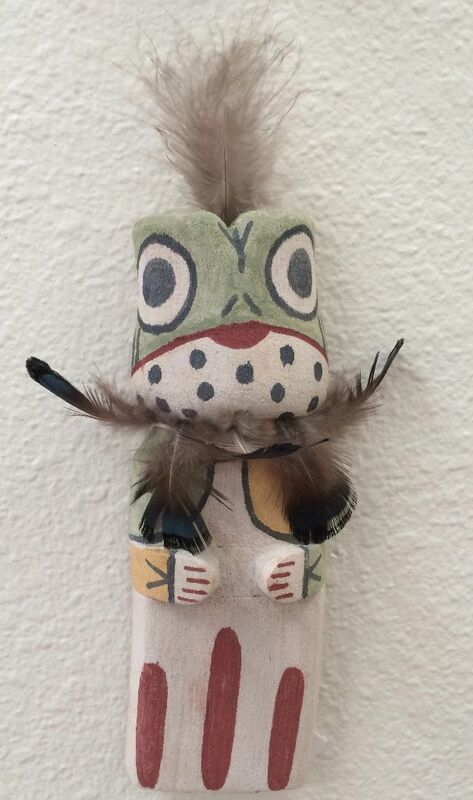 If I get stuck I might take a minute to say hello to the three Hopi katchina dolls I have on the wall, especially Paqua, the frog Katsina. There are many interpretations of his significance, but without him the rains don’t come and crops fail. He represents abundance, fertility, survival and success. These may seem silly, but for some reason they are important to my daily work routine. So that’s my confession. What’s yours? Do you have rituals that you would share with us? I carry a Babe Ruth medallion, made from a penny at the Bane Ruth Museum, to ward off The Curse of The Bambino. Until I became less neurotic, I also wouldn’t leave home without exactly six quarters, six dimes, six nickels and six pennies in a leather coin holder. And I will take any evasive action possible to avoid having a nun cross my path while on foot. I carry a Babe Ruth medallion, made from a penny at the Babe Ruth Museum, to ward off The Curse of The Bambino. Until I became less neurotic, I also wouldn’t leave home without exactly six quarters, six dimes, six nickels and six pennies in a leather coin holder. And I will take any evasive action possible to avoid having a nun cross my path while on foot. I surround myself with many things: milagros- for healing, angels of all sorts for protection….